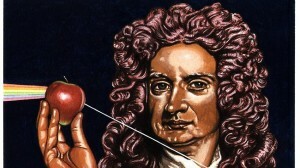 One of the most under-rated events in history was when Sir Isaac Newton witnessed an apple falling from a tree and said to himself, “WTF?” Sure, long before humankind had acknowledged that things fall and Galileo confirmed empirically that things fall at the same rate regardless of their relative weight, but Newton was the first one to wonder why. Likewise, light had been around since shortly after Heaven and Earth were created, but it wasn’t until Albert Einstein said “WTF?” that someone stumbled upon a theoretical explanation that would revolutionize the world. How long had humankind accepted that a person standing on a flatcar in the middle of a speeding train at the instant two separate flashes of lightning struck both ends of the train simultaneously would see the flashes of light at the same instant regardless of how fast that train was approaching one strike and moving away from the other? Were it not for Albert imagining such situations and wondering why, we might not to this day be enjoying the benefits that have emerged from his “Theory of Relativity”. Despite the relative relationships between time and space that Einstein’s theory introduced, we still take the concept of time for granted. We envision it as a river flowing incessantly at a constant rate from the present to the future, but now it’s time to use our imaginations. Imagine for a second, yourself and a friend strapped safely on the bullet of a gun that is fired at high velocity at a rate of, let’s say, 1500 feet every second through a crowd of people. Assuming your mind could process the information fast enough, you and your friend would gaze out from your cockpit at the people in the crowd who would look like mannequins seemingly frozen in time… if such a thing were possible. Imagine that bullet travels full circle back to the muzzle of the gun like a roller coaster arriving safely back at its terminal. Despite the apparent passage of time on the bullet defined only by your ability to process the information you perceive on your trip, you and your friend disembark into the cacophony and chaos that has yet to erupt. WTF? I don’t know enough about Relativity or the other theories that have emerged since to know if there is an explanation for this scenario. What I do know is that some clever brains have been wrapped around those kinds of questions, and if someone hasn’t already come up with a theory that tentatively explains this and potentially offers other valuable insight into other mysteries associated with time, that day will come. My point in all of this is that the average person is often blind to situations or phenomena that surround us. I submit that it is the rare for people to go think beyond the dogma of the way we live our lives and ask themselves “why” we do some things the way we do. It is even the rarer for people to be courageous enough to say “why not” and use their imaginations to deviate from convention and the status quo. I suggest this is how people identify and take advantage of opportunities that lay unexploited by the ignorant masses, and what differentiates the true “leaders” from the rest of us. Gorilla Leaders don’t hesitate to ask “why” or to say “why not”, and then set out to make life better for everybody in the community. That is why the world needs more Gorilla Leaders!